The Blue Bench is in YOUR Community! At The Blue Bench, we believe that changing the conversation about sexual assault is a community-wide effort. Click through to learn about the different prevention programs available. 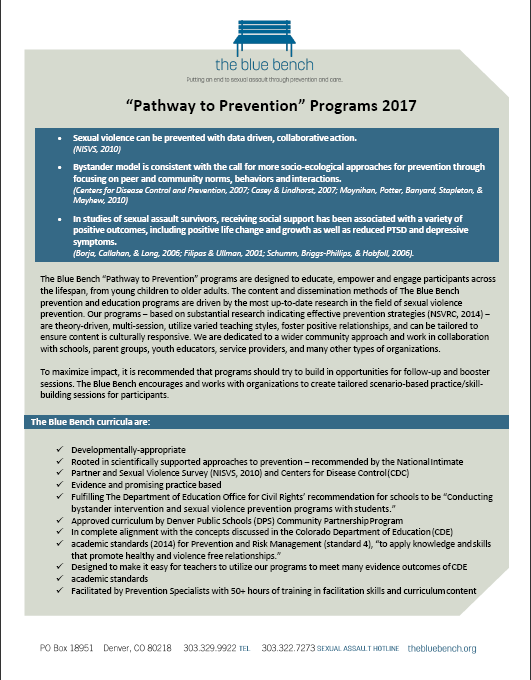 If you are part of a group or organization that could benefit from learning more about sexual assault or ways to prevent it, you can request more information or encourage your school, club, place of worship, or organization to schedule training from the Prevention Team at The Blue Bench that meet your unique needs. Please contact Susie Roman, the Director of Prevention and Education at sroman@thebluebench.org or 303-329-9922 ext. 317 for more information.